If you avoid the difficult conversation with your partner, your onions will be undercooked. 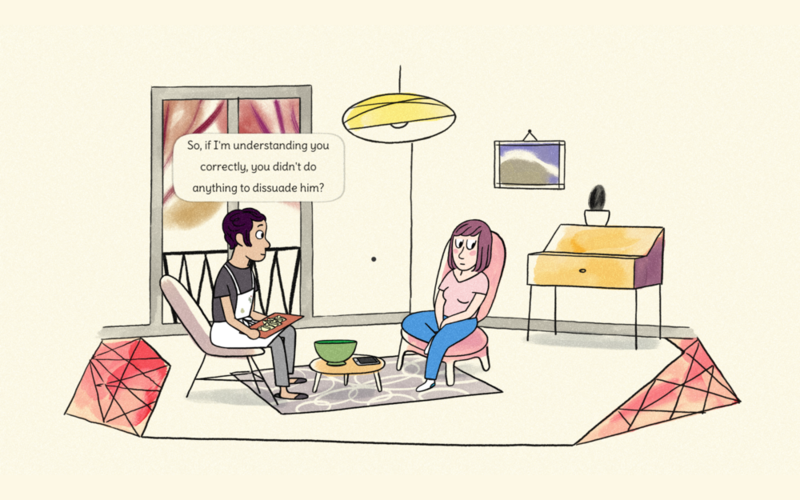 Free Love is such a neat little game about having difficult conversations with your partner. It's beautifully illustrated and tactfully written. Thank you @tweedldim for making it! I had never heard of Tweedle Dim before, and their Twitter reveals little except that they are based in France (and the game is originally in French, and called Amour Libre) and have previously made a “suntan simulator” called Bronzette that is more complex than I expected. In Free Love, you help Laura to deal with a problem that is spelled out in the description and in the intro to the game: she has kissed a guy at a party and can’t stop thinking about him, but she also has a boyfriend. Laura’s situation will feel familiar to many. At the start of the game she sits at home alone, habitually checking her phone and thinking about this person she finds attractive. Her boyfriend Diego returns home the market, and we learn – from the narrator, from Diego’s actions, and from Laura’s thoughts – that he is a wonderful man and Laura loves him. As Diego goes about cooking their lunch (with delightful sound effects) and asking Laura how she is doing, Laura faces a series of choices that involve interaction with Diego or with her phone. Given that Laura never moves from her chair, I found this restriction of interaction stark and meaningful. For one thing, I am certainly a person who looks at my phone whenever there is nothing else to do. For another, here the phone is how she follows the path of continuing to think about – and even to pursue – the guy from the party, Elliot. The only other thing you can click on is Diego, to start a conversation with him. The two men are distinguished thus, and it seems right that Elliot – the indiscretion – should be connected to the phone, which Laura looks at while Diego is out of the room. Phones already feel so laden with guilt, especially when habitually checked instead of interacting with a present partner. You can direct Laura to resist the temptation to ask a friend for Elliot’s number, or to search social media for photos of him, but the temptations are still there. The game is very clear about the feelings and desires of everyone involved, and those don’t change depending on your choices. There are three endings, but – having reached all three – I felt strongly that the one I found first was the right one. This may well be because I find it strangely difficult to role play very differently from how I feel I would act in real life. When I wanted to replay Mass Effect to explore the renegade choices I had to distance myself by playing as a male Shepard, and even then I couldn’t take the most extreme routes. So the first time I played Free Love I made Laura as honest as the game would let me. I wouldn’t say that I was surprised that Diego turned out to be open to the idea of an open relationship, because I know plenty of people – especially in the indie games scene – who have had those kinds of relationships. But I must still have unconscious biases that kept me from trusting that everything would turn out okay. The game does encourage this at one point, I think, when Laura has told Diego what happened and then asks, “Are you crying?”, only for him to reply that it’s just the onions. I’m not sure, however, that the game meant for me to read Diego as having clenched fists. I think that came from my subconscious assumption that a man in his situation would be angry. I’ve certainly had personal experience to back that up, when I told a long-term (now ex) boyfriend that someone else had given me butterflies. I was delighted to play through the conversation that Laura and Diego have if you choose to have her confess what happened at the party. Laura nervously admits her feelings about Elliot, but reassures Diego that she loves him and doesn’t want to jeopardise their relationship. Diego is kind and considerate, but firm in suggesting ground rules to apply if Laura decides to take things further. When they had talked it all through, over the course of preparing and eating a meal, I felt a thrill of excitement when Laura’s phone beeped with a text from the man she had been given permission to pursue. You can also choose to have Laura decide not to see Elliot again (“fidelity”) or see him without telling Diego (“infidelity”), but despite the game’s insistence that “there is no good or bad solution”, the “free couple” ending I reached first definitely feels like the best one to me. It allows Laura to have everything she wants, but it’s also the most interesting, the one that feels like opening the most doors. If you choose not to tell Diego about the kiss, and leave the door to that long and interesting conversation closed, then he will cook lunch too quickly and the onions will be raw. I do appreciate that the “free couple” ending isn’t presented as perfect, however. It probably seems unrealistic to some people (are there really men like Diego, so willing to accept that their girlfriends might want to sleep with other men? ), but it has its limits. Diego has his ground rules, for instance that he wants Laura to tell any other men about him, and Laura admits that she isn’t sure she would be as accepting as Diego has been with her. It feels like it could be a real conversation. There is occasional broken English, and if you swerve too much in your choices you may find your ending doesn’t totally reflect your intentions (for instance, Laura can agree to open the relationship but if she turns Elliot down you still get the “fidelity” ending). But these are quibbles. This is an absolutely delightful, beautifully drawn game that I recommend playing multiple times so that you can follow every possible choice and read every possible line.